Light and airy, summer scarf in a long shape. The scarf is made from a high-quality blend of modal, linen and silk. 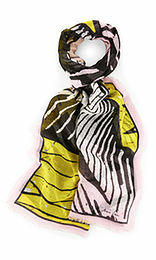 The African-inspired art print and slightly frayed edges give this scarf an exotic look.